Wolf calling experience - an esl English second language student reports! Our Esl English second language student describes his first wolf calling experience. Have you ever listened to whole pack of howling wolves? It will certainly send shivers down your spine! I woke up in the early morning. The snow was falling silently and softly as I stepped out of the Ranch House. I didn't know what to expect on my first wolf calling experience, and was slightly nervous being out pre-dawn while the wolves were around. My Guide put me at ease and it wasn't long before we were out where we needed to be. We stop and listen…nothing. The guide lets out a long drawn out, mournful howl.There is a minute of silence. 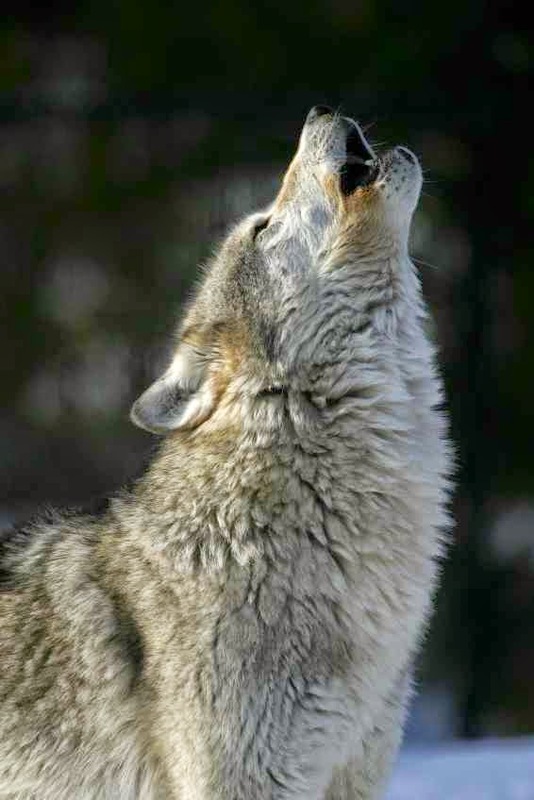 Then we hear a responding howl from the lead wolf of the pack that echoes between the mountain peaks.The guide copies the lead wolfs howl – one minute of silence – then the whole pack opens up with different pitches and tones. “The choir is ready”, says the guide and he imitates the lead wolf again and the pack strikes up in unison. They sing longer this time. Each successive exchange is more vocal and lasts longer. The guide was really getting them going. “Now it's your turn”, the guide said. I had heard the exchanges for ½ hour, but I didn't think I could do the call or get them to respond. “Go ahead”, said the guide. I gave it a go. My call came out more high pitched and didn't last as long as what I had been hearing. I was sure they wouldn't like this. But in less than a minute, their response came back as strong as before. The whole choir was present. I perfected my tone and timing and was feeling like one of the wolf pack myself. As daylight broke the wolf pack got less respondent and then finally quit all together. It was then that I realized we had been exchanging calls for over an hour, less than 100 meters from the Ranch house. I was so entranced by the mournful howl of the wolves. I completely forgot where I was. It is February 2015 – location, Chilcotin Holidays Guest Ranch.